Fortunately, many managers default to inspiration when helping employees. You can move employees toward improvement in a variety of ways. Examples: Work with them to set aspirational goals. Explore alternative ways to meet objectives. Gather best practices to try. The key is to help employees make the link between the goal and the change needed to do it. That creates desire, not fear, to succeed. The need for change or improvement often comes after a problem is recognized. Help employees improve by working on identifying issues early – and anticipating the snares they can cause. One way: Reward employees for identifying issues – not just managing problems once they’re realized. Productive discussions about improvements start and end with the same fixed goal. With progression, the manager’s and employee’s conversation focuses on how the training, learning or changes are helping to achieve the goal. Just because it’s always been done that way – and seems to work – doesn’t mean it’s the best way to do it. That’s the attitude of managers who are most successful at spearheading improvement. Sometimes – especially when the need for change is subtle – managers have to challenge standard approaches and find ways to maneuver around them. This approach is about improving judgment and people’s perception of it. Collect information from multiple resources – colleagues with differing views, data and experience – before making decisions about what needs to be improved. When employees see the boss ask for advice and do homework, they trust and follow his judgment. Change is uncomfortable for most people. Managers succeed when they help employees improve while showing signs of courage – willingness to try new things, operating outside the comfort zone or taking responsibility for mistakes. 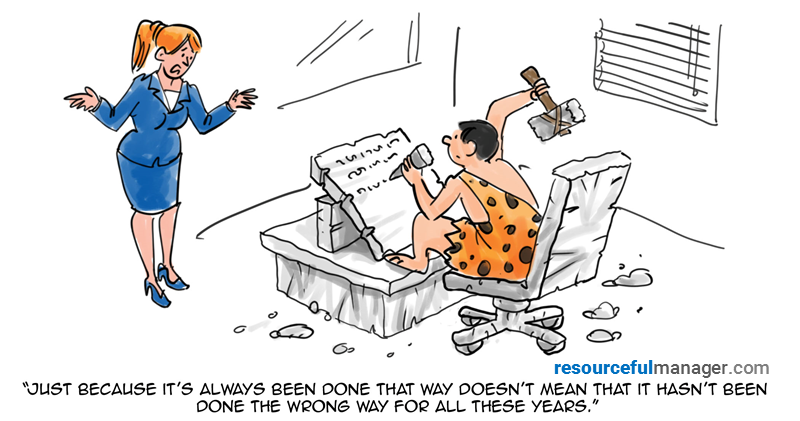 When improvement or change is the priority, it can’t get jumbled in with 50 other priorities. Managers need to take less-pressing issues off employees’ plates, help them track progress and encourage them as they go on. Nagging. Incessant requests, suggestions, and advice irritate people more than they change them. Being too nice. Trying to maintain just a warm, positive relationship when change is needed is ineffective. Managers must make some demands.